Unfortunately Francois had to give up his attempt at around 4am Tuesday morning due to his body having started shutting down on him. While we feel his pain at not completing his mission, Francois is a HERO to us and to all the Little Fighters that he represented during this monumental attempt. This young chap did not have the best of times weather-wise – he found himself cycling in the middle of a heatwave on Monday afternoon when the temperatures peaked at a sweltering 39C (102.2F) degrees, and then dropped to a chilly 8C (46F)later that evening. Total distance covered 171.8km in approximately 11hrs with 3000m – 3500m of elevation gain (final stats TBC). The weather conditions Francois faced went from one extreme to another – starting off in Hoedspruit at 2pm he faced 37 degrees and as he started with some of the major climbs in Blyde River Canyon this soon shot up to 40 degrees. This unfortunately acted as a catalyst in the unraveling of Faf’s body. He needed to take breaks and sit in the air conditioned KIA for 5min every 2 – 4 km as his heart rate was spiking and we were concerned about dehydration, heat stroke and possible seizures. Downhills and flats were few and far between as we watched Faf take on climb after climb of varying gradients and distances. As the sun set and we started making our way through to Lydenburg during the second leg and Dullstroom after that for the third, the temperature plummeted to 6 degrees. Hamstring cramps plagued the last 30km with Faf having to stop often for roadside massages. Eventually he got off his bike with the hope that if he rested for 30min his legs would come back but within that period his body went into “fight or flight” mode and he could not keep any of the supplements, meds or food down that we were giving him to recover. We then made the decision to get off the side of the road as trucks were flying past at high speeds so we got Faf into the car and drove the remaining 20km of the third leg to Dullstroom. Once there, we already knew that Faf was in no condition to carry on but we honored his wish to try and see if some sleep would help his recovery. After 2 hours we had a heart to heart chat and Faf agreed that even though his legs felt slightly better, the rest of his body was broken and was still unable to keep anything down. We then knew to pull the plug and put Faf’s health first. We are still very proud of his achievement and the awareness and funds he raised for Little Fighter’s Cancer Trust – the sheer determination we witnessed when the odds were stacked against him are testament to his character. Faf if you decide to go back and deal with unfinished business, we will happily be your support crew again! Below are the elevations that Francois had to climb on the first 3 legs that he did in extreme weather conditions. Having had a few hours to reflect on the attempt at the 24 Hour Challenge, this is my attempt to provide feedback to every shareholder in the challenge. I’ve had to accept that I failed that the goal which I myself have set, which was to complete the distance of 440 km in 24 Hours. This is a tough pill to swallow, as this challenge stretched further than only me. I had sponsors who invested their trust and resources in me to make the attempt possible, and to be honest, I do feel in a sense that I have let them down. Then, the little fighters who each day battle cancer, again if I’m completely honest, you are the ones I feel I failed in a sense. You battle each day to fight a disease which destroys life, and I failed to complete a battle for 24 hours. But, pondering on a mind-set of failure will not be of any help to me, my family and friends as well as all those who supported me in the 24 Hour Challenge. Reflecting back on the 11 hours and a few minutes on the bike, I’m still confused to what happened. In the few hours that have passed, I’ve attempted to try and get my mind around what could have led to my body failing me almost half way into the challenge. I’m aware that the difficulty of the challenge was much greater than I anticipated and that the first leg which had the greatest amount of climbing of all the legs, took place in temperature exceeding 40° C due to a heat wave in the area. All these factors may have contributed to the end of the challenge, and I will sent a while trying to understand what went wrong with the assistance of training friends and individuals in the sport science community. Moving on, I feel this response of mine should be more focused on everyone who supported me in the attempt. I first would like to thank Little Fighters Cancer Trust who allowed me the opportunity to attempt to make a small difference in the lives of those great and amazing kids who battle cancer. You support and trust in me means the world to me and have carried me in processing the events of yesterday and today. Then, to KIA South Africa. Thank you so much for being willing to invest so much resources into this challenge, and trusting in me. To Christo Valentyn from KIA, thank you for the amazing support. Thank you for helping me take a vision and making it in to a project which generated awareness for those little children fit, thank you for just believing in me even though we have yet to meet face to face. You are an amazing individual and we need for people as yourself, who is willing to go beyond what is expected of them. To Mellow Velo Cycles, thank you also for helping make this project possible by providing all the needed spares and technical support. Your trust in me and the United Challenge project means so much. To USN SA, thank you for providing me with supplements to keep my body going. Now, to the three people who suffered and fought with me in those 11 hours, my support crew. Stephanie, Douglas and Randy. I’ve thanked you a couple of times, and can keep thanking you because I will never be able to say thank you enough for what you did for me on the road. You protected me from traffic, you were there the moment I stopped and got of my bike, giving me drinks, food and getting me comfortable. As I’ve said earlier, without you I wouldn’t even have completed 10km of the challenge. Thank you for helping me each time I was down, for being willing to offer up your time and resources to sit in a car driving slowly behind me. As much as I suffered on the bike, you guys also suffered in that car, going with little to no sleep, without bathrooms, without comfort. You are the true heroes of this project, because without you there would’ve been not challenge. I’d be honoured to have the privilege of working with you three again. Anytime you need me, I will be there, because you were there for me in my time of need. Thank you for taking my health as priority and helping me make the right call, although it was the hardest call to make of my life. I have been blessed with three new friends. Lastly, little fighters. You guys are the inspiration behind what I do. You are so brave, man. I cry each time I think of you guys, and what you go through. I might never be able to understand fully what you go through, the pain and the battle. But, you guys inspire me, push me to do what I never thought possible. Please, please never stop fighting! Don’t give up!!!!! Then, before I end, thank you to each one who supported the 24 Hour Challenge with support messages or donations. Thank you. We will be back, the 24 Hour Challenge is not over. I have unfinished business, and I’ll be back soon to finish it. 24 Hour attempts are no joke. and we are extremely proud of Francois for giving it his all under conditions where most other cyclists would not even have started. 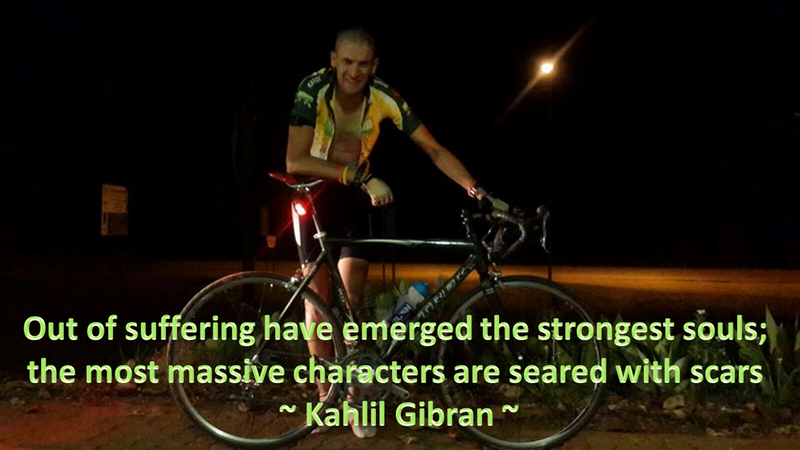 He is fully committed to keep raising Childhood Cancer Awareness and Funds, and in between the myriad of messages, someone on the Support Crew said ” We will be back“. From the Little Fighters Cancer Trust, we would like to thank KIA Motors South Africa for their invaluable assistance and Support and providing the KIA Sorento as Faf’s Support Vehicle, and covering all associated costs on the road. To USN SA – Ultimate Sports Nutrition for sponsoring the nutritional supplements which got Faf further than would have been possible without the incredible products. To Mellow Velo Cycles for sponsoring the bike spares, extra tyres, technical support on the road, you guys were incredible. To Trauma Sorg Academy for sponsoring the medical kit, which ended up being much needed. To the Support Crew; Douglas Rathbone, Stephanie Scorgie and Randy Robertson….guys, THANK YOU for taking care of our Hero on the road. Thank you for drawing on your own experience to pull him through serious difficulties, and getting him to safety. You went without sleep, food, toilet breaks, had to think on your feet, keep us updated constantly, take photographs……you were simply amazing, and we honor your individual and team contributions. To every onco-family who sent videos and voice notes of encouragement to forward to Francois and keep him motivated, we want to say, it made a huge diffirence, and you kept his mind and his focus strong. To every individual and business who donated in any way, THANK YOU. The Little fighters Cancer Trust appreciates the show of Support for the work which we do for Children with Cancer and their Families accross South Africa, and Francois so very much wanted to contribute in some way, to enabelling us to do more. Don’t you dare say that you have failed. Faf, what you don’t realise, is that, unless directly affected by childhood cancer, very few people will, out of their own, undertake to become so passionately involved with issues facing children with cancer in South Africa. You were not asked to do something, you wanted to do something. Your got up, you gave it all you had, and you made a diffirence. Maybe not quite what you had in mind, but more than most people do in a lifetime. We know you are a Fighter, we know you will continue to Fight with us. We are incredibly proud of you and most homored to have you in our corner. And we know you will be back. THANK YOU to all of you who supported this amazing young man on the road!!! This young man gave it all, heart, soul and strength, and if you, like us, feel that he still did fantastically and would like to show some support, you can still donate to the cause. PLEASE show him that what he is doing for Children with Cancer is appreciated! !